15 Responses to "August: In Review"
Aww, sorry you’ve been feeling depressed. At least out of all the books you read, only one was so-so! Duds are the worst. (I should know, since I experienced a couple this past month!) Glad to see that you thought The Raven Boys was one of the amazing ones. 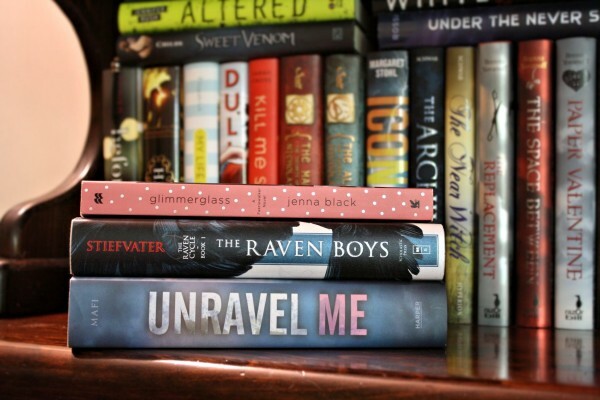 I really want to check that book out sometime, but Shiver was so disappointing to me, I’m holding off for now. I want to wait to buy any new Stiefvater books until I read The Scorpio Races, which is already in my TBR pile. If that book disappoints me, too, then I think I’ll just stick to her faerie series. I’m really, really sorry to hear that you’ve been doubting your writing. I can relate a little, since I’ve been pretty cynical about my art lately. (More-so than normal.) Even though you don’t think 2K is much, I personally find it impressive, especially since you’ve felt so down–writing anything at all is always amazing when that’s the case! Regardless, I’ll keep my fingers crossed that those 5K+ months return for you, since more productivity is always a good thing! As much as I liked Shiver, The Scorpio Races and The Raven Boys are in a whole different league of story telling. I think you’d like them both honestly, but I understand your hesitation. Whenever you do give The Scorpio Races a shot, I’ll definitely be curious what you think of it. Something about summer just isn’t good for positive creativity, I guess. Or there’s something in the water, spreading doubt to all creative types. While I wish I had a better number to report, I’m not really mad at the 2K. Last summer, I wrote nothing so anything was better than that this year.